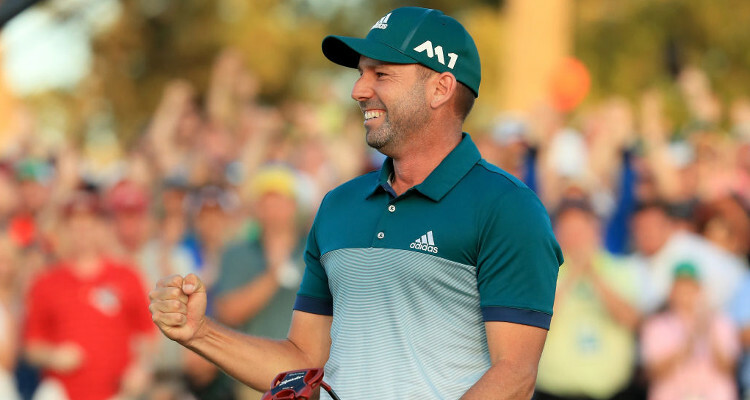 Sergio Garcia has earned the illustrious green jacket by winning his first Masters Tournament this year. With a healthy net worth of $70.0 million and a wedding later in July, 2017 is looking very good for Sergio Garcia. Those people who had doubts about Sergio Garcia’s ability to win major tournaments in golf can sing a different tune. Garcia won the Masters Tournament against Justin Rose on April 9, 2017. The Masters Tournament, is one of the four major championships in men’s professional golf. Fresh off of his first major title win, here are some details from Sergio Garcia’s wiki. The pro golfer was born on January 9, 1980, which makes Sergio Garcia’s age 37. He is from Spain and plays on both the PGA Tour and the European Tour. Garcia took to golfing at the tender age of three and was taught by his father, Victor, who was a club professional in Madrid. Garcia clearly had a talent for the sport, winning a club championship at the age of 12. Within four years, he set a record as the youngest player to make it to the 1995 Turespaña Open Mediterranea European Tour event. Garcia also went on to win the European Amateur, Boys Amateur Championship, the Catalonian Open, and the Amateur Championship before going pro in 1999. Garcia achieved worldwide fame after a feud with Tiger Woods in the 1999 PGA Championships, where he ultimately finished second. Since then, Garcia has won several major championships like the 2001 MasterCard Colonial, the Buick Classic, the Mercedes Championships in January 2002, the 2004 EDS Byron Nelson Championship, and the 2005 Booz Allen Classic. He kept on improving his game with practice and bettering his play. All of this paid off as, this year, he won the Omega Dubai Desert Classic in February and his first Masters Tournament. Ready for the Swiss Sports Awards in Zurich with @theangelaakins! With a Masters win comes a sizeable check. How much did Sergio Garcia win today? The golfer won $1.98 million after his win —the largest payout in Masters history —as well as the coveted green jacket. About his win, Garcia said, “I don’t know if I’ll be the best player to have only won one major, but I can live with that.” But this win may not be the greatest in Garcia’s life this year. He will be marrying Angela Akins in July this year. Sergio Garcia’s fiancée was an on-air reporter for the Golf Channel when he met her. Akins, who played golf at Texas Christian, wrote uplifting messages on Post-it notes which she would stick onto bathroom mirrors and other places Garcia would see them. This constant show of support and motivation really helped keep his mind in the game and secure his Masters win. Thanks to his wins and success over the years, Sergio Garcia’s net worth is currently about $70.0 million and growing. The golfer who started playing as “El Niño” (the boy) has finally earned his first major title. Today Sergio Garcia has grown and can win even more prestigious tournaments.